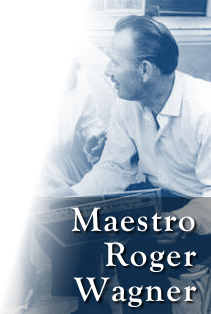 Here is a 45-page interview with Roger Wagner (PDF) dating from 1960, published in the 1962 edition of Caecilia. The interview is excellent. I was especially pleased to read the history behind his recording of Palestrina’s Pope Marcellus Mass, which was one of the first recordings I ever heard by Roger Wagner. As a matter of fact, that recording and Wagner’s unique approach was the inspiration for my Renaissance Gloria adaptation featured on the Summi et Aeterni CD. This interview is courtesy of the Church Music Association of America. The Church Music Association of America has made available many rare chant PDF’s, very similar to the hundreds of thousands of pages of Gregorian accompaniments, treatises, and editions Watershed has made available at The Lalande Library.